The Blue Ripper Miter Master™ Rail Saw creates a perfectly mitered edge by cutting both 45 degree angles simultaneously. 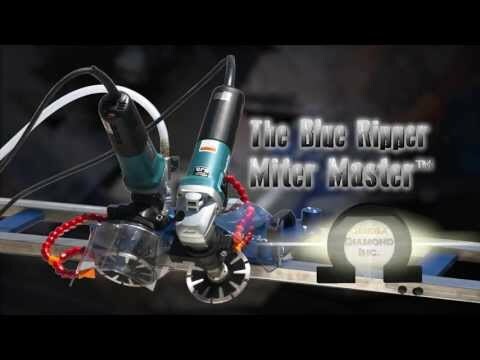 The Blue Ripper Miter Master™ comes with two free blades. Call to order, and don't forget to choose your blades! 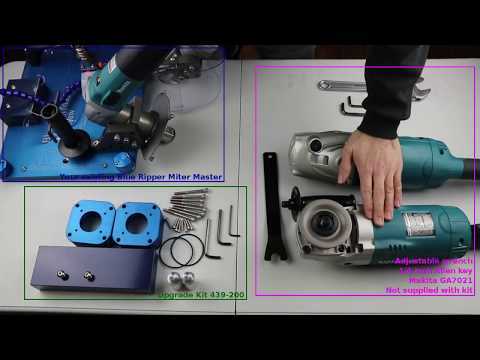 The Blue Ripper Miter Master Rail Saw is the easiest, simplest way to create a perfect miter. 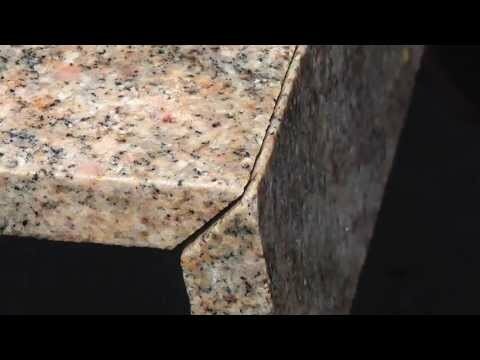 This is the saw you want if you are mitering standard stone slabs, prefabs, or large format porcelain tile slabs. Price does NOT include rails. Blue Ripper Rails sold separately. For info about ordering a saw with rails see Notes below. We suggest that you use 5 inch blades with these machines if you are cutting 2cm stone. 6 inch blades are suggested for 3cm stone as the 5 inch will tend to leave a lip at the bottom of the cut on some 3cm stone, especially when the blade wears. The best blades for this tool are blades manufactured with metal-bond side protection. 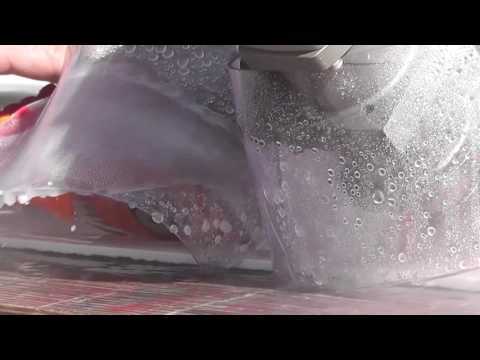 The only exception is if you are cutting very soft material like marble, travertine, or limestone - in these materials a vacuum brazed or electroplated blade, again with side protection, is what we recommend. Blade choice is critical in determining your cut speed, edge chip, and life. We've selected what we think are pretty exceptional blades for the task, however everyone has their own preference so feel free to experiment - just make sure the blade has the side protection! Please inform sales of your blade choice upon purchase of the Blue Ripper Miter Master™. 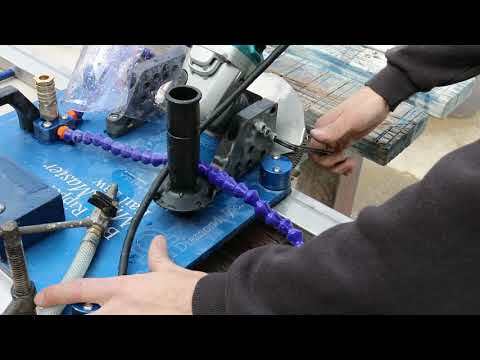 These rails are designed for all Blue Ripper™ branded machines made by Omega Diamond. 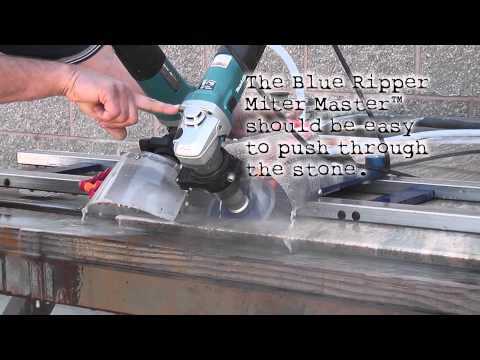 You can set up the Blue Ripper Rail™ on a slab and cut with either the Blue Ripper Sr™ or the Blue Ripper Jr™, then move the rail and switch out for the Blue Ripper Miter Master™ to cut the perfect mitered edge all on the same rail! The Blue Ripper Rails™ are sold separately and DO NOT come with the Blue Ripper™ machines unless specifically ordered (see Notes below). Please see the Blue Ripper Rails™ page for rail options. Compatible with Makita GA7021, 9564CV, 9565CV, or 9566CV motors. Shipped with GA7021. 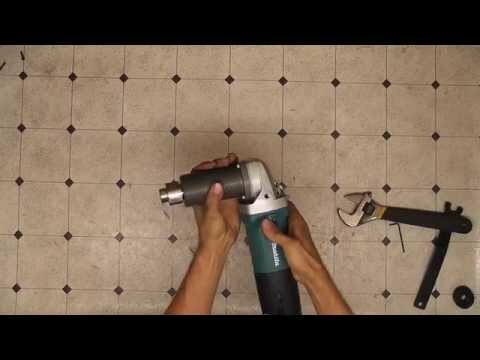 Replace with any compatible Makita grinder. Product may show minor usage (dust, etc.) due to factory testing when shipped. Product may not precisely match images. We are constantly working on each of our products to find better designs, and we ship each new machine with the best design we have at that time. You are purchasing a saw without rails - Please note that this saw requires Blue Ripper Rails™ to operate as designed. If you need rails, please see the Blue Ripper Rails™ page and call us to order. Customers in other nations: Please purchase the "without motor" option. The exact model of Makita changes per nation as the GA7021 is only available from Makita within the USA. Canadian customers: Please purchase the "without motor" option and buy a Makita GA9031Y from a local vendor. WARNING! This product contains chemicals including lead, which is known to the state of California to cause cancer and birth defects or other reproductive harm. For more information go to www.P65Warnings.ca.gov. Manufactured with PRIDE in the USA!